I made the sauce as written with two exceptions. I substituted Japanese soy for the Chinese light soy sauce and I reduced the cilantro from 2 tbs to 1 tbs. This was excellent though a bit too salty, probably due to my soy substitution. The cilantro was just right for me. (I appreciate cilantro only as a background flavor.) I didn't make her steamed chicken. Instead I served this with rotisserie chicken allowed to cool to room temp. It was really delicious and I will make thus again and again. It is really a great way to make a grocery store rotisserie chicken taste special. Delicious even though I got impatient and didn't let them boil the full time. Will definitely try again. Made a half recipe but didn't halve the garlic as I didn't want a leftover half clove. Garlic was still very subtle. Once I had the sauce prepped, before I added the orzo, I felt it was going to be way too much pasta for the sauce, but I was wrong. The balance was just right for a creamy orzotto type dish. Very much a comfort food. It is nothing particularly special but it is a nice for a light lunch from the pantry when there isnt much in the house. I did add the cheese to taste and may have needed more than called for. Would be nice with a bit of basil. Would also up the peas a bit next time. It does not reheat well so try to scalenthe recipe back to what you will eat. This is a great recipe for summer entertaining. I doubled the recipe to serve 15 people. It presents very elegantly on a platter. I used French fillet beans (which require a shorter blanching time) and double smoked bacon. I did not have any tarragon so I substituted basil. I will definitely make this again. I had Meyer lemons, so I followed the instructions for using them. The bars turned out extremely mild; they were barely tart at all. Great texture, but no tang. I loooove these. I made them with regular lemons and I thought they were lovely and tangy. I never used to think I liked lemon bars until I had these, because I don't like citrus without the tartness. The crust is better the next day but the powdered sugar does soak in, so the solution is probably to let them sit overnight and then add sugar just before serving. Almost one million subscribers heartily agree: Food & Wine is the unrivaled leader in the field - and every year the magazine's editors search tirelessly for the most delectable dishes from the crème de la crème of cookbooks. Here are their selections, along with an extra treat: some special and previously unpublished recipes. It comes to more than 100 fully kitchen-tested, temptingly photographed dishes in all, taken from the 25 best books of the year. And the food doesn't come better than this. There are recipes from Jean-Georges Vongerichten's Asian Flavors of Jean-Georges, Jamie Oliver's Cook with Jamie, Bobby Flay's Mesa Grill Cookbook, Alice Waters's The Art of Simple Food, Giada De Laurentiis's Everyday Pasta, and many more. 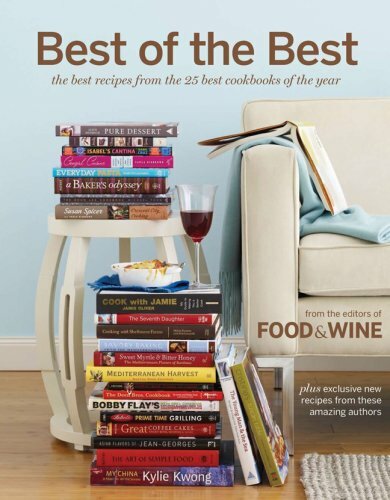 Along with these fantastic choices, there are also another 20 bonus, never-been-published recipes from almost every author, plus great tips from the Food & Wine test kitchen.